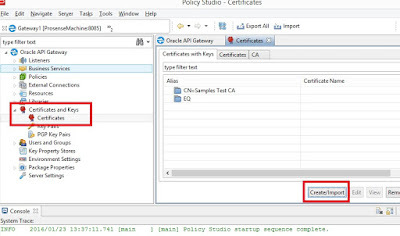 In this blog post I going demonstrate how to create a SFTP server inside the Oracle API Gateway (OAG). Click Ok and finish the certificate import wizard. This policy is used to handle the incoming file coming from the sftp client and this is required to create sftp server listener. Under Policies --> Create container "File Transfer" --> Right click and Add Policy, give the name of the policy "SFTP Incoming"
Open the SFTP Incoming policy, from the right menu go to Routing --> drag n drop "Save to File" filter. Note: For the demonstration purpose I am saving the file in local server, you can use other filters according to your usecases. This policy required to authenticate the client using username and password. Add new policy similary created for SFTP Incoming policy, give the name "Password Authentication"
Go to Users and Groups --> Users --> Click on Add, add new user weblogic. 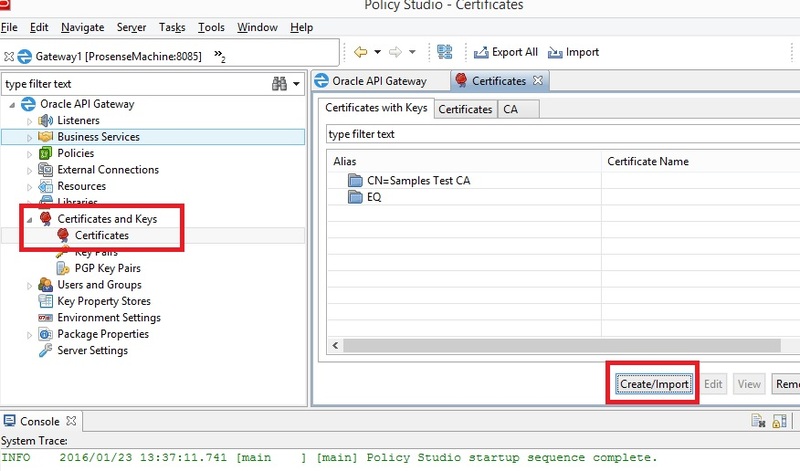 Go to Listeners --> Oracle API Gateway --> Right Click and selct "Add File Transfer Service"
Select the IA server Cert that you have created above. You can use any client like Filezilla or WinScp to test the SFTP connection. Use the user weblogic that is created in Oracle API Gateway. Hi there, have you been able to fathom out how to do public key authentication of the sftp user rather than use password? well I never tried that, but you can try passing server key pair instead of server certificate in oracle api gateway listener. Hi , Have you tried to do a POC on FTP service setup , if yes could you please share. Well I did the same way as I mentioned in the post I don't have the samples right now, if you have any issue please post here. Thanks Anshul for the reply. I want to download a txt file to my development server , it means I have to pick from source location and place in my development server. Could you please tell me what steps I have to take here like you have shown for SFTP.